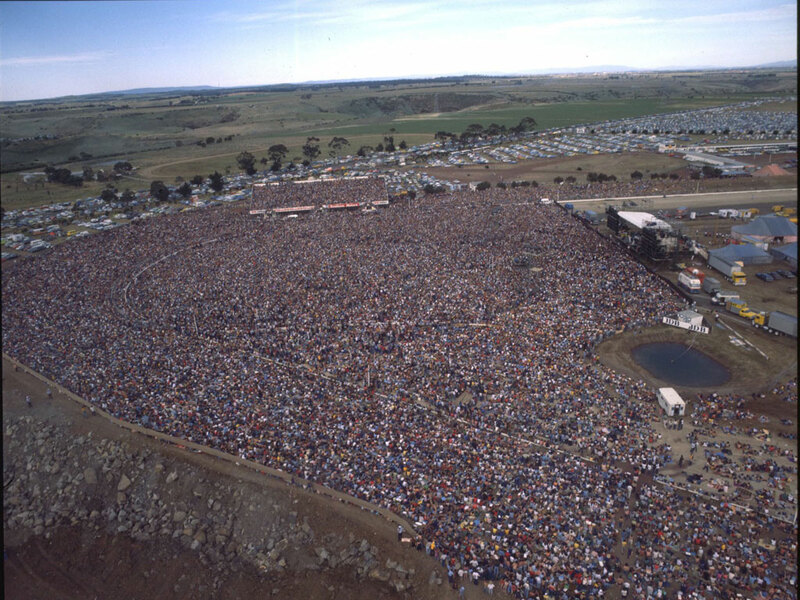 Rockarena was promoted as the biggest outdoor concert ever staged in Australia, with headliners Fleetwood Mac supported by, Santana, Little River Band, Kevin Borich Express and Creation. Outstanding footage recorded live at the Sydney Rockarena concert. Audiences will appreciate the inclu- sion of our own Little River Band in the Rockarena tour. Loyal fans have bought more than 100,000 copies of their latest album, “Diamantina Cocktail” and the cash registers are still humming with LRB sales. 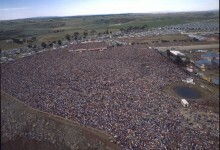 I was at this concert at Calder in 1977. Is their a DVD of the concert? I attended, along with about a dozen friends, the Rockarena concert in Sydney at the Showgounds. This was THE tour of the 70’s and it seemed everyone wanted to go. The Showground was packed to witness this wonderful lineup of bands. Fleetwood Mac were high at that time especially after the release of their sensation album Rumours and every guy was in love with Stevie Nicks! It was also great to see our own Little River Band who’d made it big in US back home and sounding so good live. I remember they did “Return To Sender” as a tribute to Elvis who’d passed away that year. I remember too the crowd were friendly and in party mood except for a couple of idiots high in the stands who decided to take a swing at a couple of cops. Everyone turned to watch the punchup while US compare Bill Graham tried to calm the situation. It didn’t work so an Aussie crew guy grabbed mike off him and told these guys to stop “f*#king around”! The fight ended and these guys were dragged off by cops in true 70’s policing style! When Fleetwood Mac finally came on the crowd went wild. They sounded great (Stevie of course looked great!) and blasted out all their hits. I don’t think I’d seen such a huge/powerfull sound system at an outdoor concert before. Would have to be THE concert of the 70’s. I was 11-years-old at the time. 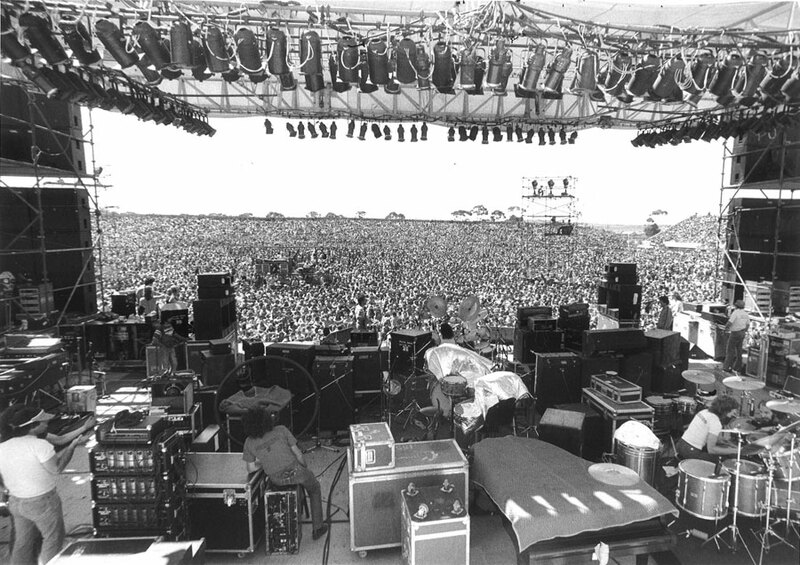 I distinctly remember hearing Fleetwood Mac’s set from our nearby apartment, which was very close to the Showgrounds. Was at the Calder raceway concert, yes was awesome … Can you get a collection of pic, posters or footage of this amazing event ??? Rockarena, Santana, guest Kevin Borich. I was at the Sydney Rockarena concert. Stevie was not at her best and Chris kept apologising for her, but FM as a whole was great. Still, I loved LRB better. Their harmonies were just jawdropping. Loved Kevin Borich too. Had an amazing time. Still have the ticket. Love the detail of the MEGA MEGA MEGA sound system, and all the gear on stage. “More strength to the arm”, of the guys that had to “make it all happen”. I was studying at RMIT that year, and possibly, being a student, didn’t have the “bread, man”, to take an interest / attend. “Just up the road” from Sunbury / the Duncan farm, and Diggers Rest, (the V-line trains “staging” station for Sunbury), and famous Diggers Rest pub frequented by many a thirsty Sunbury attendee. Hello, does anyone know where I can find a tour poster for this show please? I was there, and remember it like yesterday. Don’t take this the wrong way but Creation were rubbish I woke up from a sleep in the hot sun by Kevin Borich doing his slide guitar on I’m Going Downtown. Carlos Santana was fantastic! Little River Band it was great but I caught up with Glenn Shorrock some years later. He remembered like it was yesterday. That wasn’t that long ago in 2011. It was a hot day, the toilets a mess, but when Stevie sang Rhiannon in the cool breeze just after dusk….. the hairs still stand up on the back of my neck. 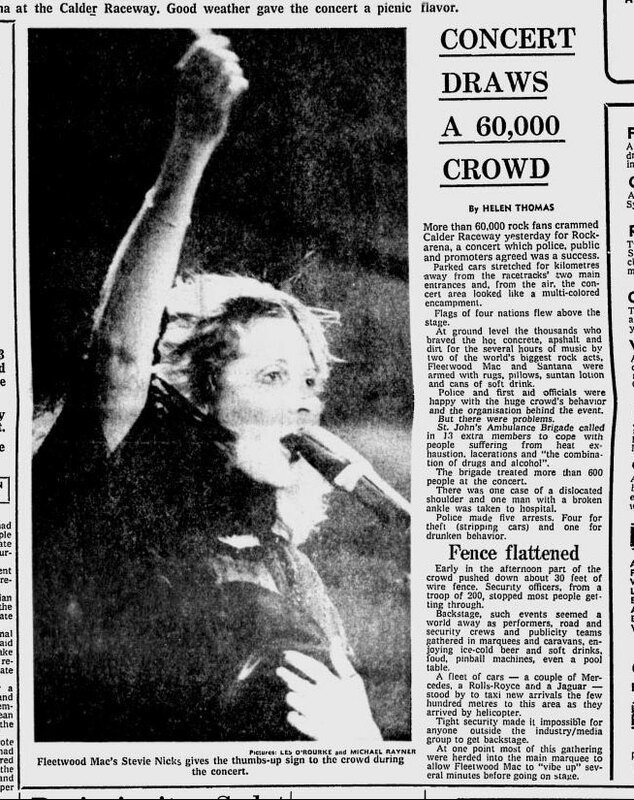 Was this the concert where Fleetwood Mac took an eternity to get to the stage, and when they finally did, all the crowd (by now, standing up and milling around) surged forward to see the headline act? After a few minutes, the people behind started yelling for them to sit down, but it was too crowded to sit – so those behind started throwing first empty beer cans and then bottles. It was terrifying . . . we all had to sit down on top of each other to avoid being injured – I never went to another large unseated concert after that – still get a bit claustrophobic in crowds. And they weren’t even that good – Santana was the standout. Great concert. Caught the overnight train from Goulburn with 27 other fellow trainee teachers. Mind blowing concert. I too remember Stevie Nicks playing Rhiannon at dusk with the breeze blowing back her hair. Remember sleeping at Melbourne station that night before catching the 7.30 train back to Goulburn. I’m from Goulburn too. Teacher’s College Terry? I think I may know you. 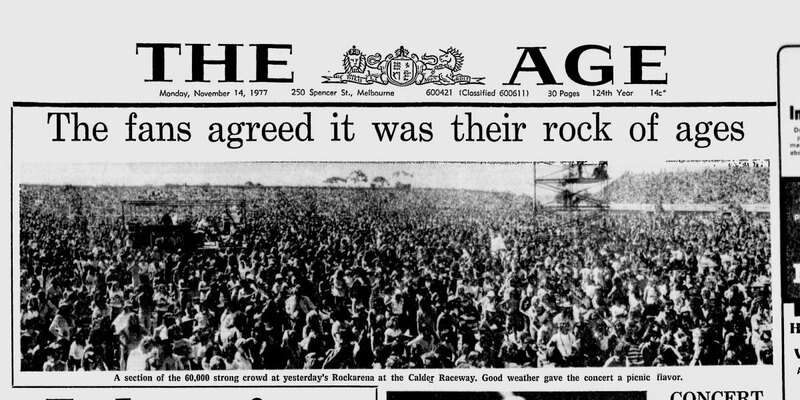 When I was 20 years old in 1977, a friend and myself traveled by train to Sydney for the Friday, November 11 concert at the Showground. We arrived early enough to claim a good central position and only had to make one trip to the messy toilets, thankfully. The entertainment began with “some Japanese band”, we later found were named ‘Creation’, followed by Borich, who was great as always. Little River Band weren’t to my taste, but surprisingly, I was really impressed by them. Santana were amazing, my favourite of the day. No one could sit still, absolutely everyone was groovin’ to the rhythm. Some bloke climbed halfway up a lighting tower to cheers from the crowd, and the smell of weed was continuously present. By dusk, Fleetwood Mac took to the stage and were quite good, but not brilliant. Stevie Nicks kept leaving the stage but they certainly entertained the audience with all those great songs, ending with Christine McVie performing ‘Songbird’. This was my Big Day Out, memorable. I’m sitting here listening to Santana blaring through my stereo & decided to google when I saw them in concert a long time ago (1977). It was such an amazing day. I was all of 15 & my step Dad was an electrician at the Sydney Showgrounds. He said us kids had to come with him to work because Mum was working. I remember thinking “what a pain”. We didn’t have tickets so we had to go & sit with all these people (bands, roadies etc lol) on the grass in front of the stage. OMG Can you imagine? I was sitting next to these “older foreign guys” & they let me play around on the bongo’s & stuff. It was actually Carlos Santana’s crew. There were heaps of roadies, friends & family just sitting around on the grass & of course up dancing when the bands were on. There were so many joints being passed around and everyone seemed to totally cool but obviously stoned! Santana were amazing on stage & are still one of my all time favorite banks (bar Pink Floyd – sorry guys). The other bands were good too. Can’t believe I was whinging about going. It was one of the best days of my youth! I remember this concert very well. I was very close to the stage with my then girlfriend and my flat mates. We were smart enough to ride our motorbikes to Calder as there was a huge traffic line up of cars in the hot sun. The crowd was both massive and generally well behaved. 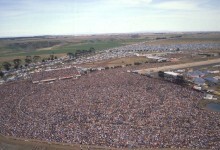 Remember Fleetwood Mac fly in by helicopter on dust, then take a while to get on stage and sing all their great songs. I was there in 1977 at the Calder raceway. Great gig. Borich a highlight for us – we were all fans of his guitar playing then. Went with five friends. We were all 16 at the time. Santana brilliant. ‘Europa’ had us in sonic heaven. We hitched all the way home and that was another adventure! Sadly my best mate died of cancer in 2013. He was there and talked of it often. Yes I was there in Sydney. What an amazing concert…Santana and Fleetwood Mac especially and of course Stevie Nicks live on stage, fantastic! I remember there was stacks of light sticks with lots of them worn around the head and arms as the sun faded….very funky!My friends and I went home and blacked out our garage pin pricked the sticks and sprayed the luminous liquid all over the ceiling and walls!! I was there with a group of friends from Wollongong. There was a bus that drove us there from the Gong and it was packed. 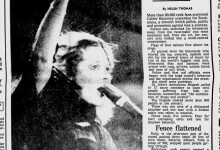 The atmosphere and concert were fantastic, I still have fond memories of it! As mentioned by someone else on here Stevie Nicks was not at her best for some reason. Overall they were good though. Santana were fantastic but being an outdoor event it doesn’t do justice to them, I think they’re best suited to an indoor arena. I still feel that LRB stole the show though. I hadn’t heard much of them at that time but I’m sure it would have really catapulted their career. I was just thinking about this recently because I’m enjoying Fleetwood Mac at the moment and I remember November 1977 at calder park racetrack when I went there with all my band friends it was a fantastic day a lot of people We sat somewhere in the middle in front of the bands there wasn’t a care in the world we just enjoyed ourselves being with our mates, I think the highlight for me was to see Kevin boridge the sound was amazing I could hear everything. I don’t even remember how I got there???????????? I went to the sydney concert with my sister. Before we got in we were walking around off our you know whats. A big limo drove passed then it pulled up.out got this huge black dude then mick fleetwood got out and asked if we needed tickets.could not beleive it. Just re-learning Europa on the guitar atm and thought I’d google this show that I went to at Calder in 1977. Cool memories. LRB and Santana were my favourite bands at the time so it was totally un-missable. Caught the special bus from Flinders St. Calder Raceway was a dust bowl in the middle of nowhere. The place was packed. We just kind of pushed our way to the front and ended up about 6 deep from the stage. It was a hot day and I got badly sunburnt. I looked like a beetroot at school for a week. Kevin Borich was great early on, and then jamming with Santana was amazing. LRB were brilliant. Santana was what I really came to see – fantastic. FM came on after dark and Stevie Nicks sang Rhiannon with flowing back robes whipped up by a dust storm if I remember it accurately. Just amazing. Getting out of the place was a nightmare. The bus got back to the CBD about 3am. I have no idea how I actually got home. A year or two later punk came along, and then new wave, for which Melbourne was one of the centres of the universe. Stadium rock all seemed so irrelevant by then. I wouldn’t have listened to this stuff again then if you paid me. But it’s a fond memory again now. But the first Cure tour, Magazine, and Siouxsie and Banshees are my Melbourne lifetime gig highlights (Crystal Ballroom and Astor Theatre), with honourable mention to Kraftwerk at the Princess Theatre. All 1980/81. I was there at this concert. Was about 6 metres from the stage looking up at Santana, Stevie Nicks, Kevin Borrich and LRB. Rode our motorbikes there and had an absolute ball. 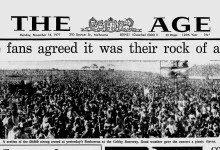 one of my best memories – it was the day of my boyfriends last HSC exam in 1977. what a way to celebrate – schoolbeingoutforever ! 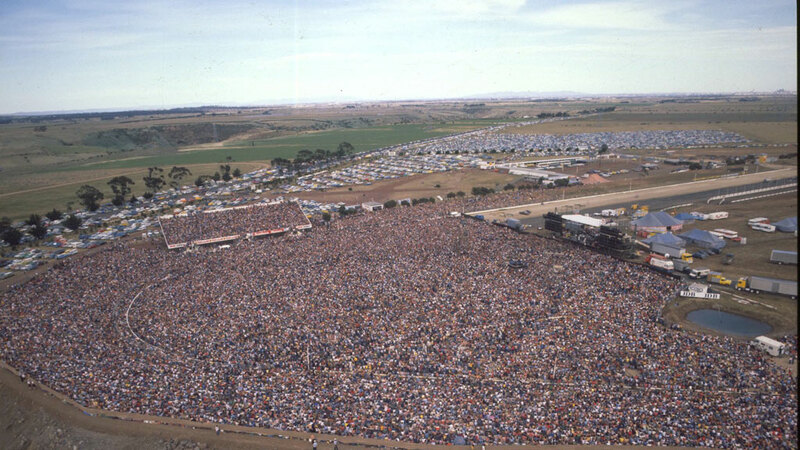 Calder park, Man, I was there too, the LOOOOOONNNNGG queues to get in, listening to the support band till we could get past the gate. Then the call “SANTANA” Just fabulous. Waiting to heat Fleetwood Mac and the buzz and cheers that went up when they appeared on stage!! Sunburn and an exhausted Chris and a couple of friends finally found our car and followed the white coated staff to an exit that took us on a road we didn’t know in a direction we didn’t want to go but we eventually found our way home. Survived a fantastic concert with many memorable acts. This one will be there in my mind for ever. Is the hour and half set by Santana all that is on video from the Melbourne Rockarena? Who shot that? Watermark says ROckVision? Anyone know whether any other vision exists of the Melbourne gig? I’m pretty sure Channel 7 recorded the entire show, all acts, but only ever screened the Santana set highlights over 2 weeks on Nightmoves. They should have it all in their archives. I was at the Calder Rockarena concert aged 14 with 4 others and it was fantastic! Hot dusty day, sunburn,long cues to get in…I remember there was a guy mooning the crowd from the embankment.